The unannounced HTC One Mini keeps showing up in leaked photos acting as if it were officially unveiled, but this time the smartphone is sporting a look that's a horse of a different color. 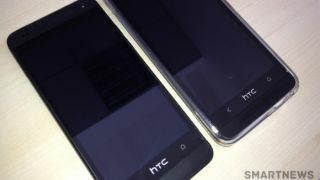 The latest unconfirmed HTC One Mini pictures feature a new black color option, according to unnamed tipsters who sent the images to Bulgarian site SmartNews. This contrasts with the previous images of a grainy silver or white version of the phone that showed up online last month. The HTC One Mini color options are pretty unsurprising, as its bigger brother, the HTC One, has offered silver and black choices since its March release date. Aside from the new black color, the HTC One's latest appearance backs up its all-but-confirmed specs. This includes an Android 4.2.2 Jelly Bean mobile operating system on a phone outfitted with a 4.3-inch display, 2GB of RAM and 16GB of internal memory. Although that's a downgrade compared to the HTC One's 4.7-inch display and 32GB and 64GB storage capacities, the Mini's Sense-driven version of Android is actually an upgrade. The HTC One from carriers comes with Android 4.1.2. Only stock Android models of the phone from the Google Play Store include the newest version of the mobile OS. With so many leaked details about the HTC One Mini, it appears that the only thing HTC needs to do is confirm a release date and price for its Samsung Galaxy S4 Mini competitor.